Mommycon! Who's going?! There's an upcoming conference in Pasadena, California on August 18th, 2018! Some of you might be asking, what is Mommycon?! Well, Mommycon is a nationwide convention that is focused on celebrating and nurturing the community 0f parents and soon-to-be parents -- specifically those that aim to take a more natural/gentle approach with parenting (such a natural birthing, breastfeeding and baby-wearing). They have several admission levels for the conference: VIP Admission (includes 2-day admission, access to all sessions and events and a VIP gift bag), Premium Admission (includes a single day admission with access to that day's sessions, events and a gift bag), and General Admission (includes a single-day admission with access to that day's sessions and events). It's being held at the Pasadena Convention Center, which is located at 300 East green St., Pasadena, CA 91101. Parking is available at the convention center for $13/day (up to 16 hrs) or $18/day for in-and-out privileges. You can even book your parking online before you go! For more info on parking, hotel accommodations and rental car discounts, head to www.mommycon.com! You can also check out the schedule for each day on the website and plan your trip accordingly! There are going to be so many amazing sessions and exhibits... truly, if you are a parent of a 5 year old or younger or even an expectant parent, and live near Pasadena, CA, then you're not going to want to miss Mommycon this year! This post is sponsored by Danone; however, all thoughts and opinions are my own. 1) Wake up, roll out of bed. Check my emails, social media and then do my devotions (I've been slacking on this lately -- need to get back on the wagon!). 2) Get the kids breakfast and set up in their highchairs with a show (we're not huge on tv but it definitely comes in handy when I need to get ready). I turn on my curling iron and hair straightener, then do my makeup while those are heating up. My entire makeup routine takes less than 10 minutes -- I'm big on the natural look so I usually just stick to moisturizer, concealer, foundation, setting powder, bronzer, blush, brows, mascara and eyeliner. Okay, that sounds like a lot haha, but I promise it's not! ;) And then mayyyybe a touch of lipstick, depending on where I'm going! A quick makeup routine is key for me and I've got this one down to a science. 3) Okay, hair! I get a lot of questions about how I do my hair and let's just say... it's not complicated haha! It usually only takes about 10-15 minutes, so super manageable!! Just like the makeup. Are you sensing a pattern here? Ha! Also, I typically only wash my hair every 10 days or so, which helps a lot -- and I know, WHAT?! But my hair is naturally very curly and very coarse, so it really doesn't require frequent washes! So I wash, dry and straighten it once and then just curl and touch up the curls every morning for the remainder of the time. It's simple, it's quick, and it's the only way I'm actually able to get ready every morning haha. 4) After I'm done getting ready, I turn off the tv for the kids and then make myself breakfast while they play. I usually stick to something sort of light but also full of protein because I have low blood sugar -- so a protein shake or avocado toast, soft-boiled eggs and potatoes, something like that! And, of course, a big ol' cup of coffee (sometimes I do decaf if I'm jittery, but I just like having something warm to drink in the mornings). Literally, you guys... it's my favorite time of the day: the kids are pretty happy and are usually playing nicely together (afternoons are a different story haha! ), and I get to just sit there with them, nursing a warm cup o' joe and just watch as they interact. It's glorious. 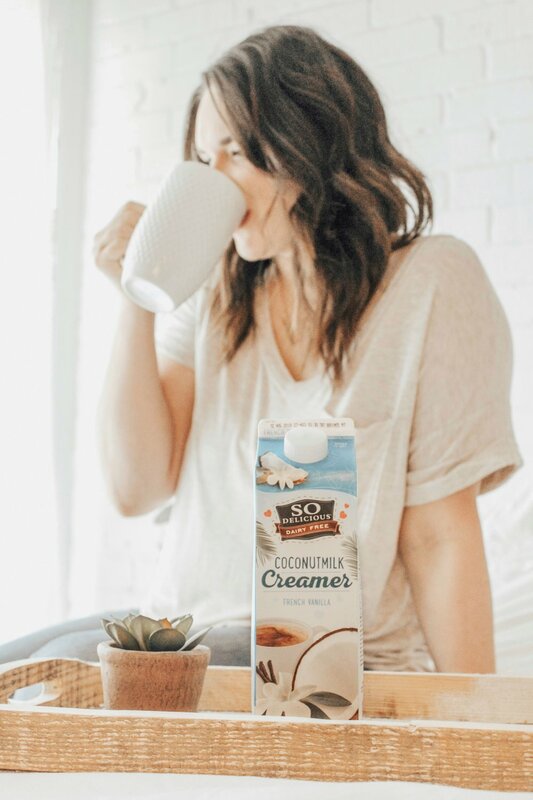 Also, if you download and use the Cartwheel app, you can get 10% off So Delicious Dairy-Free Creamer from June 10th through July 7th! I can't wait for you guys to try this one out -- I think you'll love it as much as I do! Springtime is one of my favorite seasons of the year (the other being all things fall/Christmas) -- mainly because it means all things fresh, new, light and airy! It's the perfect time to clear out your closets, buy homegrown blooms from the farmer's market, dust off your shelves and change out your flannel bedding and throws for their lighter counterparts. It's exciting! It's like breathing new life into dark spaces and I just LOVE it. And now for the AFTER!!! I ended up going with the Pebble Mesh area rug in the color Spun Sand (trim in Oatmeal) in a size 9 x 12. We had an 8 x 10 in the room previously, but I really felt like we could go a little bigger and it would still look good in there -- it's a rather large space anyway and it opens up to the dining room, so I liked the idea of the rug kind of setting the living room apart from the rest of the house. Plus, my kids love playing down on the floor, so I love the fact that they can spread out their toys now and really go to town. I was so impressed when we unrolled the rug and laid it out -- it truly is such high quality (meant for high-traffic areas) and so cushy (the pad that was included is also a huge bonus). One of the best parts about Tarkett and their site is the fact that you can literally customize everything -- rug color, trim color, size, all of it -- which is such an amazing feature! I decided to replace our gallery wall over the couch with just a couple simple black and white prints of the kids, along with two bronze wall sconces from World Market. I got tired of the busyness of the gallery wall and really just wanted something that fit a little better with my (ever-evolving) style and it turned out even better than I hoped! In addition, we changed our couch covers from a light tan to a bright white -- which some people think is crazy since we have young kids in the house! Haha! But I actually think the white will be easier to keep clean because I can just bleach the heck out of it, if needed. Win win! We also updated our throw blankets, ordered a new tufted ottoman coffee table (which is STILL waiting to be shipped as I write this -- anyone else hate when things get backordered?! haha) and snagged some new end tables at our local IKEA. All in all, I'm SO happy with how the makeover turned out -- everything feels so fresh and so new! It really is amazing what just a few simple changes can do for a room. If you're looking to refresh your own space or just need a new rug, head over to http://app.markerly.com/b/35598/309 and check everything out! You can also use code SPRINGBLOGGER for 25% off a rug of your own (valid through 6/30/18)!! Let me know what you think of our before and after -- do you like all the changes??! This post is sponsored by Perrier USA; however, all thoughts and opinions are my own. It's SUMMAAAATIMEEE!! Ahh! I'm so excited! To be honest, I've never been a huge fan of the whole summer season, but having kids has somehow changed all that -- I think it has to do with the fact that we get the chance to break out of our schedule and make so many fun memories together. SUMMER -- it just feels warm and fun and full of possibilities! Here are our top to-do's this summer -- some of them are personal but all of them are meant to spark excitement and adventure (plus, there's a little popsicle recipe at the end that you HAVE to try! Blend all the ingredients together and then pour into popsicle molds. Leave in freezer for 4 hours or until fully frozen. Enjoy!!! I loved using the new Peach flavor of Perrier's Carbonated Mineral Water in this recipe! It's bursting with fruit flavor and is so refreshing but has zero calories and zero sweeteners, which is super important to me -- we are pretty conscious of what we feed our kids and they rarely get anything sugary! So this was the perfect addition to our popsicles! Let me know if you try it, I'd love to hear from you!